You think it's easy being a food blogger? Not on your nelly, honey. Stove Lady challenged me to participate in NoJoMo - November Journaling Month. I've got to write something everyday in November. Last night, after I finally pried myself away from the computer (sometime around 1:32 am), I realized I had two problems. There was nothing to write about and nothing for breakfast. Scrounging around the kitchen produced a bowl of granny smith apples. Have you ever wondered who was Granny Smith? She must have been one heck of a cook. No matter the recipe, her apples retain their firm texture and sweet-tart taste. Seeing that bowl of granny smiths took me right back to my college days. 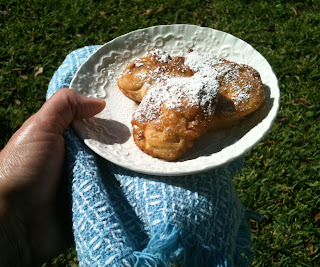 Apple fritters were a regular treat for my roommate Loretta and me. Apple fritters must have been invented at a slumber party. They seem happiest among giggling girls. Problem solved. I mixed up the batter and let it rest overnight. The next morning, the fritters were a snap to make. Good thing, too. A food blogger must also photograph every thing she cooks. Today was one of those diamond days - a day when everything sparkles. The fritters deserved a chance to go outside. 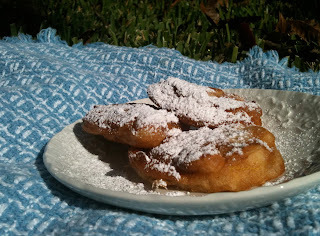 So there I was, ladies and gents, outside in my jammies taking pictures of fritters on my iPhone. I had to endure the ridicule of the neighbors to bring you this recipe, so you'd better darn well make 'em. Combine liquid and dry ingredients. Cover and refrigerate overnight or at least two hours. Remove from refrigerator and stir batter. Stir in apples. Have a pot of deep oil heated to 375º. Carefully drop batter by spoonfuls into hot oil, making sure not to splash oil. Do not crowd pan. Cook until brown on one side. Turn and cook on other side. Total cooking time should be around 3 – 5 minutes. Drain on paper towels. Dust with powdered sugar.